You may toss celery in with soups or stews or perhaps munch on raw celery every now and then, but celery isn't a vegetable you probably envision for its health benefits. You might want to think again, though, because it's jam packed with nutrients, some of which may help ward off Type 2 diabetes and benefit diabetics. It is estimated that by 2030, 439 million adults worldwide will suffer from this disease, so keep celery on hand and make it an easy and inexpensive part of your healthy diet. One cup of chopped celery contains more than 29 micrograms of vitamin K. Vitamin K reduces inflammation, which may increase your sensitivity to insulin and improve your glucose metabolism. A study published in 2010 in "Diabetes Care" examined the vitamin K intake of 38,094 men and women between the ages of 20 and 70 years. The researchers discovered those with the highest vitamin K intake had a lower risk of Type 2 diabetes compared with those with the lowest intake. The same bacteria that can wreak havoc on your stomach may also contribute to Type 2 diabetes. Helicobacter pylori is a bacterium found in the stomach that causes inflammation and ulcers. A study published in 2012 in the "Journal of Infectious Disease" discovered that adults with H. Pylori in their gut had higher blood sugar levels than those without H. Pylori. This bacteria can triple your risk for Type 2 diabetes. 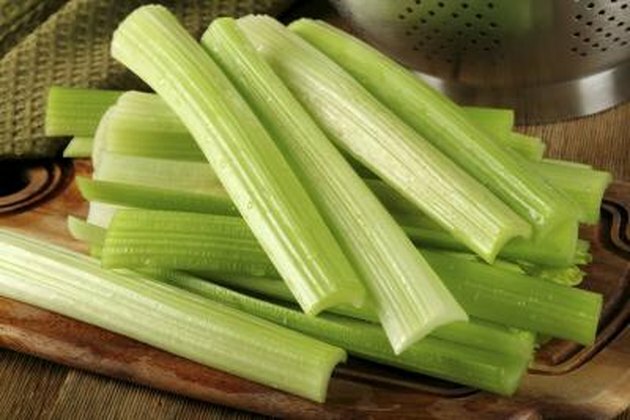 You don't always feel its symptoms, so munch on celery, which has the unique ability to block the growth of H. Pylori and reduce your risk of Type 2 diabetes. If you have Type 2 diabetes, you are at an increased risk of heart disease and bone and joint disorders, according to Medline Plus. Eating celery may help prevent these associated health conditions. The calcium in celery protects your blood vessels and cartilage and improves bone function. By halting sharp increases in blood sugar, celery protects your pancreas. It also assists in controlling blood pressure and lowers the lipids, or fat, in your blood, which protects against heart disease. Celery acts as a diuretic, which rids your body of extra water and salt to prevent swelling. Celery is found in Chinese herbal medications to treat or prevent diabetes, but always speak with your physician before trying any alternative medicines. You can also make tea by boiling 8 ounces of water and adding 1 to 2 teaspoons of celery seed. Otherwise, cut up celery at the beginning of the week and keep it in your refrigerator for an on-the-go snack. Enjoy it with peanut butter, hummus or low-fat dressing. Kidney Service China: Is Celery Good for Type 2 Diabetes?